It was gray and overcast, the sea was churning, and the wind was fresh from the Southeast – perfect conditions for watching a parade in early November….and watch we did! Our viewing location was North Beach on Cape Cod’s back side, all the way from East Orleans to Chatham. “Marching” in this winged parade were over 40,000 sea ducks and seabirds, all headed southward in a more or less continuous passage emanating from destinations as far away as Alaska, western Canada, James Bay, Labrador, the Gulf of Saint Lawrence, and Newfoundland. This timeless event was part of the annual migration of vast numbers of waterbirds, all originating in nesting grounds far to the north, and all bound for winter destinations well to the south. The departure of waterbirds escaping the rigors of sub-arctic and boreal winter is part of a great migratory cycle that has evolved through the millennia into one of the most magnificent autumn spectacles to be witnessed on the Atlantic Coast of North America. When migration conditions are ideal, the number of birds involved may exceed extravagant! And so it was on November 5, 2017. Between 8:30 a.m. and 3:30 p.m. my companion and I tallied approximately 12,000 Common Eiders, 18,000 Black Scoters, 5000 Great Shearwaters, 3000 Northern Gannets, 100 Razorbills, 400 Black-legged Kittiwakes, and 550 Bonaparte’s Gulls. When combined with lesser numbers of numerous other species recorded that day, we estimated we had seen over 44,000 waterbirds in approximately seven hours of more or less continuous watching! 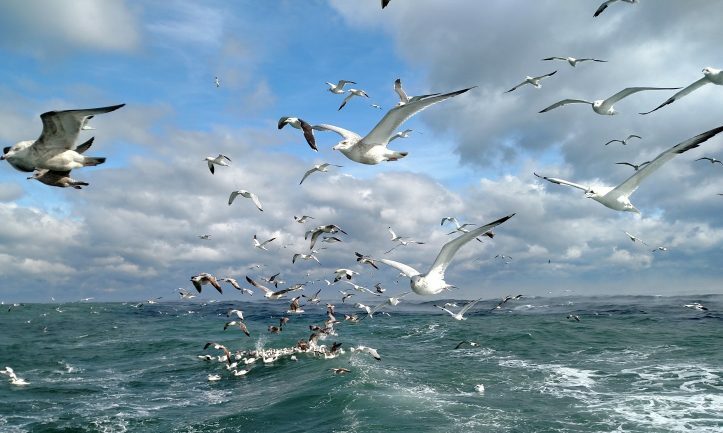 The dynamics and precise timing of such movements varies from species to species, but the net effect is unequivocal—the birds moving under such conditions are singular in their purpose, and all are taking advantage of weather frontal conditions and wind directions in ways that will maximize their migratory efficiency. The sea ducks (e.g., Common Eiders) were flying in linear or loosely organized groups, often numbering in the dozens or low hundreds, sometimes flying low over the wave troughs, and sometimes well above the sea surface. The powerful gannets on the other hand tended to fly high, often more than 50 meters above the sea, occasionally turning abruptly and plunging into the sea to catch a fish during their journey. 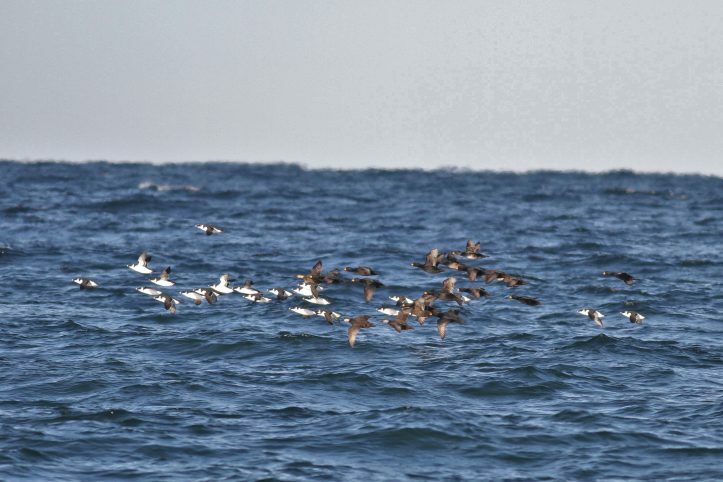 The shearwaters scaled like skipping stones over the sea as far as the eye could see, alternately using the wind between the wave troughs to carry them upward well above the waves, and rapidly gliding downward between the waves to catch another updraft that would carry them skyward again. The more delicate and tern-like Bonaparte’s Gulls stroked along in small parties relatively close to the beach, while further off shore, football-shaped Razorbills would periodically rocket southward between the wave troughs on stubby wings that reminded one of flying penguins. All this motion, and all headed in the same direction, even though few were bound for the same precise destinations. Many of the Black Scoters and Common Eiders are likely headed for the shallow shoals off Monomoy or Nantucket where great submarine beds of blue mussels will sustain them through the winter. Other scoters however might not stop until reaching New Jersey or shoal waters off the Mid-Atlantic Coast for the winter. The Northern Gannets will likely precipitate out along the continental shelf all the way from Cape Cod to the Gulf of Mexico. Most of the Bonaparte’s Gulls will no doubt spend the winter from North Carolina’s outer banks to Florida and the shores of the Gulf of Mexico. The Great Shearwaters, however, will not stop until they arrive at their austral summer destination on the Patagonian shelf off Argentina, or the remote archipelago of Tristan de Cunha. So many birds and so little time to accomplish these epic migrations! 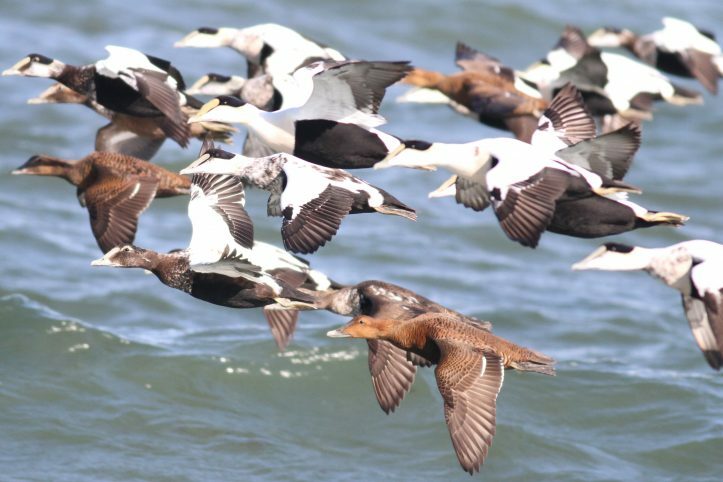 However, for land-bound observers privileged to live in a region where these avian parades are seasonally visible from shore, these great waterbird movements represent one of the most dramatic natural parades to seasonally be observed in Massachusetts. So the next day a brisk east wind is blowing on the heels of a cold front, grab a pair of binoculars and head for the nearest coastal headland! You won’t be disappointed. This entry was posted in Birds and Birding and tagged birding, birds, fall migration, seabirds on November 15, 2017 by Wayne Petersen. We wait for the eiders who return year after year to ride the currents in Cape Cod Canal. It’s comical to watch them fly a distance and then ride the current back occasionally diving for a fish. At the inlet at the west end of the canal the current forms a giant circle. The eiders look like they’re riding a merry-go-round. Wonderful article, Wayne! I could feel the thrill of the day. Thank you.